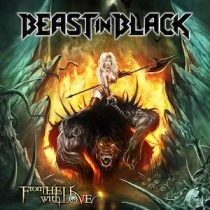 From Hell With Love is the second album from Finnish power metal force Beast In Black. Debuting with 2017’s Beserker, Beast In Black formed after guitarist Anton Kabanen parted ways with another of Finland’s fine power metal offerings, Battle Beast, in 2015. 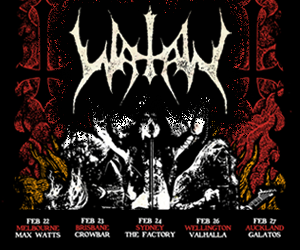 From Hell With Love features the recording debut of new drummer Atte Palokangas, and this time Beast In Black has charged headlong into the gauntlet of the broken heart. While From Hell With Love sounds a lot like a bunch of 1980s movie montage runs, it is done extremely well and in all honesty the sultry synths and steady grooves of the ‘80s sound is a refreshing turn in power metal. Beast In Black invokes the 80s-vintage in a similar way to a project like The Night Flight Orchestra. From the opener Cry Out For A Hero, From Hell With Love is actually quite easy listening. Beast In Black’s sound is infused with a pop-rocking 1980s vibe, courtesy of catchy synths and steady, mid pace grooves. The big choruses are carried to profound dimensions by the high-pitched pipes of Yannis Papadopoulos. Standing out on the album is the gallant pace and palpable rage of Repentless, emboldened by choral backing and stellar soloing, rendering it something of a Euro-power version of O Fortuna. With tracks such as Sweet True Lies, Die By the Blade, and Heart of Steel, Beast In Black invokes the 80s-vintage in a similar way to a project like The Night Flight Orchestra. Although a very different sound, Beast In Black seems to have a similar idea to pursue a characteristically ‘80s stylistic twist which is potentially cringeworthy, yet pursued with such sincerity for what it actually offers, it becomes a work of art in itself and somewhat endearing. Ending with No Surrender, the sense that Beast In Black has a 1985 blockbuster soundtrack in mind lingers. From Hell With Love is gloriously overstated, and it walks the delicate line with clichés but really, this is what we came here for.